Brighton Center's business trick-or-treat brought out hundreds of kids and their parents Friday afternoon. 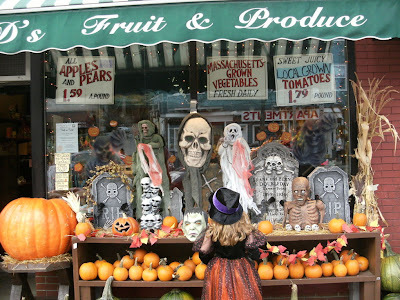 Hands-down prize for Best Storefront With a Halloween Theme -- in the Locally-Grown Skeleton category -- goes to Johnny D's Fruit and Produce. He was also handing out lots of candied apples, as usual -- an amazing treat for the kids. The big pumpkin on the left is Johnny's annual guess the weight of the pumpkin contest. I predict 367 pounds. Two years ago, I wrote about how Gregory Glennon, candidate for Allston-Brighton District 9 City Councilor, was so thoroughly unresponsive to attempted contacts by various neighborhood residents (including myself). It was difficult to arrange a candidates forum and debate that year, because he didn't respond to repeated requests about scheduling, related issues, and media requests for comment. After I wrote that post, even more people contacted me to tell me that I was 100% on target in that criticism, providing their own stories of emails and phone calls that dropped into the netherworld. His non-responsiveness was peculiar, given that Glennon had said during the campaign: "I will always be available. Every phone call will get returned, every email, every letter." This year, we have a winner of the 2009 Gregory Glennon Award for Least Responsive Candidate in an Election Campaign: Doug Bennett, candidate for Boston City Councilor-At-Large. When a Boston Globe reporter managed to get him on the phone to ask about why he was seen running a red light in front of the Globe's office building, Bennett abruptly ended the conversation. OK, that's not such a bad thing to do with a pestering reporter, right? Well, he hung up on a reporter from the Dorchester Reporter in May. He was "snippy and unresponsive" with Boston Phoenix reporter David Bernstein when asked about some details of his campaign finance reports. All of the At-large candidates, except for Doug Bennett who was invited but never bothered to return calls or e-mails to schedule a meeting, met with the staffs of the Allston-Brighton TAB and West Roxbury and Roslindale Transcript at different times over the past few weeks. And when we organized the BAIA candidates forum earlier this month for the Councilor-At-Large race, we were unsure whether he knew about the event -- let alone whether or not he would show up -- until the afternoon of the event, because we didn't get responses to our repeated queries. His campaign website doesn't list a phone number; Bennett never responded to my emailed request for the phone number, so I put his home number in the handout to attendees at the forum. Bennett has not returned a voicemail message asking about this odd trend of non-responsiveness. I didn't bother writing Bennett to ask him to comment on this post. Trick-or-treat at local businesses that display one of the flyers in their windows. 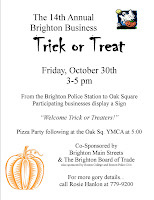 From D-14 station (which usually has a goodie bag) to Oak Square, where there will be pizza at the YMCA at 5 pm. Not to miss: Johnny D's, who is usually handing out candied apples. There will be Folk Singers and Acoustic Bands, Tons of Treats, Games, Sidewalk Chalk for Halloween Murals, Free Market/Flea Market, Bobbing for Apples, Costume Contest, Scarecrow Making, Pumpkin Painting, etc. - Perhaps a Ghost Walk in the Woods! Spread the word - It will be Fun!! 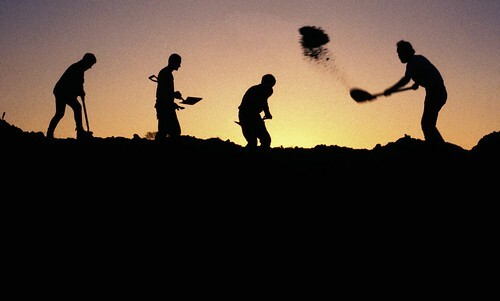 One of the basic rules of crisis management and organizational communications is that when you find yourself deep in a hole, the first thing you do is stop digging. The BRA slipped into that mistake on Monday. The Boston Redevelopment Authority has been criticized during the last few days over a project manager's emails that were viewed as disparaging towards some Allston-Brighton residents. Mayoral candidate Councilor-At-Large Michael Flaherty, his unofficial running mate Councilor-At-Large Sam Yoon, District 9 City Councilor Mark Ciommo, and Ciommo's challenger Alex Selvig -- as well as Mayor Thomas Menino himself -- all expressed criticism of the BRA's emails on Monday. The BRA was doing a reasonably good job at crisis management over the issue: the employee was disciplined in response to a Boston Globe reporter's inquiries; the employee offered an apology; criticism from Flaherty was forcefully rebutted by BRA director John Palmieri; etc. Political campaigns are fair game for this kind of back-and-forth; that's what the sport of politics is all about. Who might she be speaking about? I can think of some. Four Allston-Brighton residents wrote to the BRA on October 13, 2009, stating that they "support a Charlesview relocation proposal incorporating the following revisions and recommendations." And those were some pretty substantial revisions they requested. Who are these obstructionist A-B guys who are "trying to stop the relocation of 700 residents"? That hole just got a bit deeper. I think the BRA needs to drop the shovel again and stop digging. Image of Digging in the Dark by Wessex Archaeology provided through a Creative Commons license. The BAIA forum held on October 15th for the candidates for Boston City Councilor-At-Large was taped by Boston Neighborhood Network and can be viewed online from their website. The video is in MS wmv format. The program was broadcast on BNN around a half-dozen times during the week or so following the original event. Thanks to BNN and Dan Moore for taking the video and getting it online! The business trade groups of Allston-Brighton sponsored a forum tonight for the two candidates running for the Allston-Brighton District 9 City Councilor seat. Incumbent Mark Ciommo and challenger Alex Selvig took questions from moderator Michael McCormack, former City Councilor-At-Large from A-B, and each other. Here is my attempt at "dead-blogging" the proceedings, i.e., blogging about it after it's over, not "live-blogging." The Allston-Brighton TAB has their story on the event here. SELVIG: [offered welcome in Spanish] I have been in area for two decades, four years working on a moving truck, then started own business. "Allston-Brighton's future is hanging in the balance of this election." Schools: I'll have a child in the public schools; Ciommo doesn't. BRA/BC: I stood against it, Ciommo stood in support of it. Liquor licenses and developers: Ciommo received nearly $20,000 in campaign contributions from them, I didn't. CIOMMO: Respect today's concerns while preparing for tomorrow's challenges. I helped hold down spending, maintain low property taxes, and create a database of information on property owners. My vision for A-B: I'm the only candidate who is a product of BPS, and will fight for an A-B school zone. Q1: How would you best represent the diverse constituency of residents and businesses? CIOMMO: I was a youth worker, assistant director here at JMCC. Helped found group with mission to reach out to immigrants. Was director of the senior center, where I hired both Russian and Chinese translators. Been member of the ABOT and BBOT during that time. Socio-economic diversity is in my background. SELVIG: Many immigrants don't have papers. Spoke to former D-14 captain Genevieve King about not reporting immigrants during police activity. Q2: What programs would you initiate to engage the local business community? SELVIG: "local business should be patronized by local people. let's try to spend our money in their stores." CIOMMO: As a member of ABOT/BBOT, I attended meetings, went to their events. "I would reach out to them, and be accessible and responsive." Example: Harrell's had problem with newspaper boxes in front of the ice cream store; we got them (re)moved and installed bike racks instead. Not just jobs I held, but also in civic organizations I participated in. Q3: What are your thoughts about phasing out busing, and what to do with the savings? CIOMMO: I am on record in support for the 5-zone plan. We are spending more than $80 million per year on transportation; 5-zone plan would save $10 million. I spoke to district councilors, telling them that all the savings should go into the underperforming schools in their districts. Glad that the superintendent is still working on how to implement this plan. "It's time has come." When I went to school, A-B was a pilot program for busing, so I got a multi-ethnic experience. SELVIG: "It is absolutely vital for the health of this community that we have neighborhood schools." You don't have the opportunity to go to Charlestown and East Boston to visit with teachers; too far away. The 5-zone plan is good for A-B. Regarding the money being spent on transportation, "That money is not strictly for racial integration." Q4: What do you think are the pros and cons of institutional expansion? SELVIG: Pros: building trades. "The key to this development has to be a neighborhood that is livable. It is important that we preserve the quality of life for this neighborhood." We have a whole planning department, but there is no city plan. Downside is that you get ad hoc planning and have problems with your infrastructure. Our traffic problems get worse without a blueprint from the BRA. CIOMMO: "Our community is inundated with institutional expansion," although a number of other neighborhoods have it to some extent, too. Pros: construction jobs, permanent jobs. St. Elizabeth's MC opened new ER; waits are now down to an average of a half-hour. The colleges need to house more students. "On Harvard side, we have no development, we have a pause." That's not good for the community. Q5: How are you going to advocate for commuter rail in A-B, and which stop(s)? CIOMMO: Previously: studies said that A-B could not support a commuter rail stop. Now: I've attended all EOT meetings, they now see the need. I joined with colleagues (elected officials) to support Everett Street stop pending further study. Guest Street corridor has many vacant commercial buildings that are ripe for development. SELVIG: "Commuter rail is a shovel ready project that qualifies for federal stimulus money." We should advocate for more than one stop, like Newton has. There are also smaller trains (than commuter rail trains) that could be used instead on the same tracks. With Harvard's buildout we'll have 12,000 more people working in North Allston but who have no way to get them there. Q6: ISD is supposed to ensure property owners maintain their property. How will you hold ISD accountable in doing this? SELVIG: Ciommo and the mayor's budget this year cut ISD funding by $300,000. That money could easily have been found elsewhere. $3 million could have been saved by eliminating fire call boxes -- something that people have been talking about eliminating since 1994. I would've increased ISD's budget. CIOMMO: I started to do that [ensure ISD enforcement] by creating property owner database with instantaneous contact information. We respond to every call. Just did it two days ago -- called a property owner who had an overgrown lot to get him to clean it up. This year, we got $140 million less in state aid -- but we were able to balance the budget by not laying off any ISD person, firefighter, or police officer. If you see a problem with properties, call my office, ISD, DPW [department of public works], or the community service office [at the police station]. Q7: What plans would you initiate to deal with the rat problem in the neighborhood? CIOMMO: The entire city of Boston has a problem with rats, not just A-B. We have a program ready-to-launch, but it has been delayed. "when you see a rat sighting, please call my office." As well as call ISD and the Mayor's constituent service hotline. Everyone in A-B will be getting a secure-lid recycling bin, once we launch this program. SELVIG: Going back to the previous question: I think it is a fairly easy decision to remove all the fireboxes to save money. That would give $300,000 back to ISD, $200,000 back to elderly, [and something else]. [Back to rats:] "It needs a real effort to take care of a serious public health problem in Allston-Brighton." Residents told me that they are afraid to allow their kids to play in their backyard. I'll roll up my sleeves to deal with this problem. There are only seven companies licensed to trap/remove rats in the entire city of Boston -- [a disgrace]. Q8: What are the first three initiatives you will implement if you are elected? SELVIG: 1. Space in local schools for every A-B child. 2. Involve the community in helping ISD address absentee landlord and party houses. 3. Promote home ownership in A-B -- our city services suffer as a result of too low owner-occupancy. Planning process to address low owner-occupancy rate. Also, we have less greenspace than the city of Boston -- we need to build more. CIOMMO: 1. State $600 million shortfall in this year's budget needs to be dealt with. End of last budget we had a $30 million budget gap we addressed. 2. Continue to advocate and support the 5-zone BPS plan. 3. Creating a constituent service response team, including people from the district councilor's office, ISD, Mayor's ONS/hotline, DPW to work together effectively. Q9: What is your stance on late hours for bars and liquor licenses? CIOMMO: With the BAIA and ACA, many establishments ask to extend from 1am to 2am closing hours. "I have never supported one; not one has passed while I have been in office." "I will not support any new [increased number of] liquor licenses in our community." SELVIG: Pretty much on same page as Ciommo. Our neighborhood is impacted by drunkenness. I opposed extended hours as treasurer of the BAIA. SELVIG asks Ciommo: In 2007, you promised you would reform the BRA. In the last debate, you supported an external audit of the BRA. Will you call for a hearing to push for these reforms? CIOMMO: I will call a meeting -- and ask the chair of that committee to call for a hearing. CIOMMO asks Selvig: In your campaign press releases, you have said that you worked to improve the schools, which you have said elsewhere that you haven't done [because your son is not yet enrolled]. Why is your campaign saying this? SELVIG: "That was an oversight in our press releases." The work I've done is landscaping, improving appearances. The press release wording has been corrected -- thank you for pointing this out. CIOMMO: "I have never been motivated by money." Lots of those donations to my campaign come as $10, 25, or 50. I give the same priority to those who do and don't donate to me. CIOMMO asks Selvig: During 2007 campaign you referred to your business selling boats. Why have you not participated in the BBOT? SELVIG: I don't do a retail business [like those members in BBOT] -- my customers are all over the country and in Canada. I would be happy to be a member if they asked me to join. SELVIG asks Ciommo: The night before the preliminary election, Wallingford Road voters received flyers under their doors giving direction as to how they should vote for mayor, councilor-at-large, and district councilor. 70% of those votes were exactly as on that flyer. Would you support an inquiry into what's going on over there? CIOMMO: We all canvas and drop off campaign literature under doors like that. They support me because of my work for the elderly. How would you explain the vote in Ward 22/Precinct 5 [location of Selvig's campaign office] which voted for me at the same rate? The Wallingford Road voting places were investigated several years ago, and I believe that they were cleared. CIOMMO asks Selvig: How would you split your time between your business and your work as an elected official? SELVIG: I will not do both. The last two years I had to spend a lot of time down at City Hall. the Zoning Commission meeting [in May] lasted until 1 am. Ciommo spoke in favor of the BC institutional master plan, then went home at 7:30 pm. When you get a petition of 600 signatures, I will be in that meeting room until 4 am to support them. CIOMMO: I know how to do this work, because I've been doing it for decades. In the past two years I've launched a "fight-the-blight" program. I worked with EMS -- and a concerned resident -- to improve ambulance response times in A-B. I brought parents, BTD together to improve traffic around the Gardner Pilot Academy. I got the field house opened up for the Brighton High School football team at their practice field. SELVIG: The more we are involved, the better things will be in our neighborhood. The key is that we call city hall when we have problems. "We are in a tough situation and, frankly, it hasn't gotten better." This whole neighborhood might become a big college campus unless decisive action is taken at city hall. Half of the property in Boston is tax-exempt. The burden is then on the other half -- us -- someone needs to represent us. The BRA is very powerful -- I want to change it. And I won't take donations from liquor interests or absentee landlords. Image of [left-to-right]: Alex Selvig, Mark Ciommo, and Michael McCormack. The two finalist candidates for Allston-Brighton District 9 City Councilor have sent in their campaign finance statements. Their forms were due October 26th covering the period September 5 - October 16, 2009. Both candidates provided their forms electronically, even though district city councilor candidates in Boston file their campaign finance forms on paper with the city clerk. The candidates' generosity saved Mattison and I from having to schlep down to city hall and pay $0.20 per page for photocopies. Boston's city clerk has begun posting online scanned versions of the district city councilor campaign finance report; at the moment, that is being done voluntarily. Starting January 2010, city clerk's will be required to post the reports electronically within 30 days, a result of legislation passed as part of the state ethics reform overhaul last summer. The previous campaign finance reports for the period covering January 1 - September 4, 2009 can be found here. Substantially more money has been spent on this campaign to-date (over $120,000) than was spent at the similar point in the 2007 campaign for the open seat up to the same reporting period (over $102,000). That is very unusual for a race with an incumbent. Challenger Alex Selvig has outspent incumbent Mark Ciommo to-date by around 20% (approximately $62,300 vs. $52,000). Ciommo raised all his money from more than 400 donors to-date, while Selvig mostly self-financed his campaign with loans totally $66,500 this year (and another $11,000 loan carry-over from the 2007 campaign). Selvig continues to be the hands-down winner of this year's "John Corzine--Michael Huffington--Mitt Romney Award" for self-financing in an election campaign. Ciommo's campaign workers appear to be partial to pizza from Imperial Pizza in Brighton Center -- down the street from his campaign office. Nine different orders over a five-week period. Selvig's interns favor Big Daddy's Pizza near to their campaign office in North Allston-Brighton. Selvig's 10/26 campaign finance report includes more than $10,000 in reimbursements paid during the reporting period on 10/6 for expenditures made during a prior reporting period, i.e., during the campaign leading up to the preliminary municipal election. The receipts include more than $7,600 for printing (presumably mailers) between 7/7/09 and 9/14/09, dates that all were before the preliminary election. My prior estimate for the total money spent on the preliminary election, based on the 9/14/09 campaign finance reports, was therefore a substantial underestimate of the true expenditures at that time. Both candidates are expected to spend more money between the end of the reporting period (10/16/09) and the election itself (11/3/09), which will not be reported until the end of the year. Notes: "Own Money" includes both loans and "In-Kind" contributions paid for by the candidate. "In-Kind Contributions" from a person other than the candidate are not included in the table. Personal loans have been removed from the "Total Receipts" (Schedule A) and instead included under "Own Money". Number of contributors is for itemized contributors. It is not necessary for the campaigns to itemize contributions under $50: Ciommo itemized all receipts, while Selvig lists $75 in non-itemized receipts. ** Selvig lists an ending balance that is a net debt. My impression is that the debt is in addition to the outstanding liabilities on the campaign account due to personal loans totalling $77,500 made by Selvig during 2007-9, but I could be wrong. 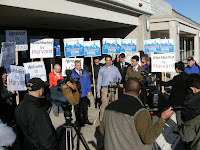 Mayoral candidate Michael Flaherty, currently a Boston City Councilor-At-Large, came to the Brighton Mills shopping center this morning to decry the negative attitude expressed in email by some city officials towards Allston-Brighton residents over the proposed Charlesview relocation development project. He was joined by his unofficial running-mate, Councilor-At-Large Sam Yoon (together, "Floon"), as well as District 9 City Councilor candidate Alex Selvig (together, "Floonig"?). Flaherty noted at the press conference that he and Yoon "work for you, and Mayor Menino works for you, [and] the BRA does, too. But you would never know it from the emails. One of the things we don't need to be doing is disrespecting [residents of] the neighborhood." "The residents of Allston-Brighton deserve better than this," added Yoon. The emails "communicate a message that the people [of Allston-Brighton] don't matter." "What we're up against is resistance, what we're up against is contempt," said Selvig. He said that their campaigns are about trying "to build us a city hall that will fight for us... instead of rich and powerful developers." The Boston Globe published extracts Saturday from internal emails written by Boston Redevelopment Authority officials -- particularly by senior project manager Jay Rourke, who is in charge of the BRA's review of the proposed project -- which were disparaging towards a number of people in the community. The emails were obtained by North Allston resident Harry Mattison in response to a request for documents under the state's Public Records Law, and were published by Mattison on his Allston Brighton Community Blog. The Globe article states that the BRA last Thursday, in apparent response to their reporter's inquiries, issued a verbal reprimand to Rourke and a letter in his personnel file. Rourke also issued some kind of apology to the neighborhood. “These are internal e-mails," the Globe quoted him saying. “They are my comments to staff members and should not reflect on the agency." Flaherty said that he, as a city-wide official, wanted to apologize to the neighborhood residents on behalf of the city for the "disrespectful" language of the emails, even though he did not author them. The press conference was held at the site of the proposed Charlesview relocation project, which would construct 360-units of low-income rental and market-rate home-ownership housing. In response to several questions about the development Floon flailed a bit, not appearing to be knowledgeable about controversial aspects of the project -- such as an allegation that the project entails economic segregation by spatially separating the low-income housing units from the market-rate ones. Selvig was well-versed on the project, however, and noted that the proposed development only includes far less than the city-wide average of green space and a lower home ownership rate than both the city-wide average and Allston-Brighton itself. Both halves of Floon pointed instead to broader deficiencies in the approval process itself, and the BRA's role relative to Mayor Thomas Menino, in describing how they would have approached the Charlesview project differently. Yoon said that the development process works better starting with community input and a blank sheet of paper, rather than have the BRA run it based on a developer's proposal. Yoon's community-led process "respects [the community's] integrity. It's doable. It's been done. It's not happening now." It's ironic that he didn't seem to realize that a group of residents of North Allston-Brighton obtained the services of a city planner to do exactly what he envisioned by creating an alternative development plan for the Charlesview relocation. Flaherty took a more direct tack. People need to "realize the mayor is the BRA," said Flaherty. "The whole sham needs to be disclosed. They make decisions unilaterally." He was also deeply critical of the BRA's public meeting process. He repeated his proposal that developers should submit to a "performance bond," whereby they would "commit to doing what they promised to do." He broadened his criticism to the mayor's handling of Harvard's expansion into North Allston-Brighton. "I wouldn't have sat on the sidelines while Harvard used straw buyers" to purchase many acres of land. Added Selvig: "Harvard has really done wrong to this community. The Charlesview plan is only good for Harvard." Reached by telephone later in the day, Councilor Mark Ciommo had some choice words to say about the BRA emails. "Without question, totally unprofessional, disrespectful, and inappropriate," said Ciommo of Rourke's emails. "It just doesn't help the public discourse or process." When asked whether he thought that Rourke's verbal reprimand and letter in his personnel file was an appropriate punishment, Ciommo responded that he as a supervisor ascribes to a procedure of "progressive discipline action." "If [Rourke] had no other prior issues," then this would be the appropriate first step of discipline, he said. "I hope he's learned a valuable lesson from this." As for whether these emails indicate that the BRA is responding to community input, Ciommo noted that, between the Charlesview project's first filing in 2008 and its revision in 2009, the emails as a whole indicate that the BRA was pushing the developer to modify the project to be less dense and have more home ownership. Both were issues voiced by neighborhood residents and the elected officials -- although Ciommo acknowledged that it is difficult to identify exactly whose input the BRA was being responsive to. Ciommo also noted that he assisted Mattison in obtaining the emails from the BRA without the cost that the agency had originally proposed to charge. Monday's press conference was attended by a number of media outlets, including NECN, Fox25 News, the Boston Globe, WBUR, the Allston-Brighton TAB, and the Boston Bulletin. The mayor says the BRA has done a good job, both in present projects and in the future. Menino bristles at the accusation that the BRA is a failure of his administration. He acknowledges the poor taste of the e-mails, and says action has been taken. "[Rourke's] lapse doesn't reflect the authority's point of view in how we deal with the neighborhood," Palmieri said. "On the contrary, we make every effort to maintain our balance and integrity with how we deal with these neighborhood issues." Elsbree called the plan “a bit of political rhetoric” and questioned how the Flaherty administration would replace the BRA, which currently has a $50 million operating budget generated by leased properties throughout Boston. She also stated the BRA has requested Harvard reactivate empty business properties throughout the neighborhood, but did not set any deadlines for the school to make these locations available. There were a lot of hugs offered, too, at least metaphorically. Another property, which McCrea highlighted during the debate, went to James Rourke, who works for the city’s development agency. He and his Hyde Park neighbor got a 10,000-square-foot property for $5,000 in June. It was assessed at $99,400. Then-mayoral candidate Kevin McCrea brought this property sale arrangement to the public's notice during a mayoral debate and on his blog. All 13 members of the Boston City Council, including Flaherty and Yoon, voted unanimously on November 2, 2008 to surplus the land at 0 Prescott Street to the city; Mayor Menino subsequently signed the surplus order on November 10, according to the deed for the property on file at Suffolk County Registry of Deeds. Rourke this year contributed $200 to Mayor Menino's reelection campaign on June 19th -- ten days before the city concluded the sale to him of the Hyde Park parcel. He also contributed to Menino's campaign in 2005 and 2006. Earlier this year, Rourke appeared to be uninformed about statutory requirements of the state's Open Meeting Law which permit public videotaping of a public meeting held by the BRA as part of the regulatory review of the Charlesview relocation development proposal submitted to the city. Rourke was also the project manager several years ago overseeing review of St. Elizabeth's Medical Center institutional master plan amendment to construct a new emergency room -- and approving a neighborhood-opposed access road alongside an historical monastery building. The access road encountered its own roadblocks in subsequent review at the state level, and was never built. Saturday's Globe article noted that Rourke lived in Allston for 27 years when growing up. Image of, left-to-right, Michael Flaherty [blue jacket], Harry Mattison [blue shirt], Alex Selvig, and Sam Yoon. Update (10/27/09): Added comments by Elsbree from TAB article. During the Floon press conference this morning, I was busy taking some photos when Councilor-At-Large Michael Flaherty, candidate for mayor, launched into a hard-hitting criticism of the way that the Boston Redevelopment Authority runs its public meeting process as part of the review of proposed development projects. “A lot of the community meetings you reference -- I got to be honest with you -- they're dog-and-pony-shows,” Flaherty said, jabbing his finger in the air. “The cake is baked. The decisions have been made. They’ll comment out there and 'yes' you to death. But most of your concerns are never, ever reflected in the final submission of a project. So you can go to a hundred community meetings and you'll be banging your head up against a wall because that's the way development works in the Menino administration." Flaherty's soliloquy was offered in response to North Allston resident Paul Alford's criticism of Flaherty's and Councilor-At-Large Sam Yoon's spotty attendance record at community meetings in A-B. Brent Whelan offered a defense of Yoon, mentioning a two-hour tour Yoon attended with neighborhood residents (including me) a while back to give him a visual layout of the area. I have in the past obtained pages and pages of sign-in sheets for BRA public meetings as part of finding out which candidates for public office have been involved in the community in this particular way. Flaherty's office (whether him or his staff) have fared poorly, while Yoon (mostly his staffers) have been a bit better. Alford's criticism is not inaccurate. Yoon's retort in the form of a question -- How many BRA public meetings has Mayor Thomas Menino attended? -- was met with the Socratic answer: zero, i.e., fewer than either Flaherty or Yoon. (It should be acknowledged, however, that a member of the mayor's staff, the Allston-Brighton coordinator in the Mayor's Office of Neighborhood Services, is a regular attendee.) None of the three has a particularly good record of attendance at community meetings, while Yoon noted that Mayor Menino is a regular attendee instead of ribbon cuttings all over the city. Flaherty's impassioned statement shows the frustration that he feels at the public process in these development project reviews. And Flaherty's response is a dead ringer with dozens and dozens -- if not hundreds -- of identical comments that I have heard repeatedly expressed by Allston-Brighton residents about the BRA review process. Literally -- I'm not exercising hyperbole here. I have heard such comments so often that I don't write them down anymore. Flaherty's words could've been spoken verbatim by many of the residents lined up behind him who have been at all those community meetings, week-after-week, month-after-month, year-after-year. Alford can raise Flaherty's absence at public meetings as possibly indicating that Flaherty's new-found involvement in North Allston-Brighton is a campaign ploy. But while Flaherty may have been AWOL, his summation of the BRA public meeting process makes it clear that he has heard, and taken to heart, repeated complaints by Allston-Brighton residents. Video of the debate between the two candidates for District 9 City Councilor is now streaming online to a computer near you. You can watch it below or at this link on Vimeo. I would like to thank two people for their extensive effort in putting together this video and getting it online: Abigail Furey, who took the video last Tuesday night; and Galen Mook, who loaned Furey the equipment, and then did all the processing/uploading to put the video online. Such work is a great public service, because the video allows the debate to inform a much broader than the audience of 80-90 who showed up for the event itself. District 9, Boston City Council Debate, Oct 20 from Galen Mook on Vimeo. Questions were three types, interspersed: moderator-prepared; audience-submitted; and candidate-written. The business trade groups of Allston-Brighton -- Allston Board of Trade, Brighton Board of Trade, Allston Village Main Streets, and Brighton Main Streets -- are sponsoring a candidates forum for the District 9 City Councilor race. Incumbent Mark Ciommo and challenger Alex Selvig will be participating. Parking available in Jackson-Mann's garage. The Boston Neighborhood Network is streaming online a report they filmed at Tuesday night's debate between the candidates for District 9 City Councilor -- incumbent Mark Ciommo and challenger Alex Selvig. See the video stream of BNN's report embedded below or follow this link. 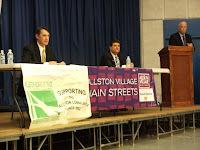 Allston-Brighton City Councilor Debate from Chris Lovett on Vimeo. The Ward 21 Democratic Committee in Allston-Brighton voted Wednesday night to endorse four candidates for Boston City Councilor -- one for District 9 City Councilor and three for the four positions of City Councilor-At-Large. For District 9, the committee endorsed incumbent Mark Ciommo. For the at-large seats, the committee endorsed incumbent John Connolly and challengers Tito Jackson and Ayanna Pressley. District Nine Councilor Ciommo and At-Large Councilor Connolly have worked hard for the people of not just Allston and Brighton, but all of Boston. We believe they will continue to work hard and do what is right for the citizens. Ayanna Pressley and Tito Jackson are wonderful candidates and will be wonderful At-Large Councilors at City Hall. They provide fresh, new solutions to Boston and have a vision for the future of Boston, including Allston and Brighton. "I am honored to have earned the endorsement of both the Ward 21 and Ward 22 Democratic Committees, as well as the support of Representative [Kevin] Honan and Councilor Ciommo. I have worked hard to represent the best interests of Allston-Brighton and will continue to do so. My law partners Cathi Campbell and Tim Schofield live in the neighborhood (in fact, we have an office in Brighton Center) and they help me to stay informed about the issues facing Allston-Brighton and to be responsive to the needs of the community." Jackson responded to the news via email, saying: "I am truly honored by the Ward 21 nomination. I look forward to working with the residents of Brighton to continue to hear their issues and partnering with them to find solutions." I am honored to receive the endorsement of the Ward 21 Democratic Committee, especially in light of the fact that it requires a 2/3 consensus to secure. I was also endorsed by the Ward 22 Democratic Committee. These endorsements speak to my broad-based support throughout Allston-Brighton, and with ten days until the election, I welcome the support of grassroots civic groups like these. While Felix G. Arroyo did not get the nod from either committee, his website lists an endorsement from Senator Tolman. Two years ago the Ward 21 committee endorsed Ciommo for the district 9 seat, along with then-challenger Connolly, as well as then-incumbents Felix B. Arroyo and Sam Yoon for the at-large seats. The committee did not endorse for the district 9 seat in the preliminary municipal election last month; any perceived black eye from that non-endorsement appears to have healed over with the committee's new endorsement. 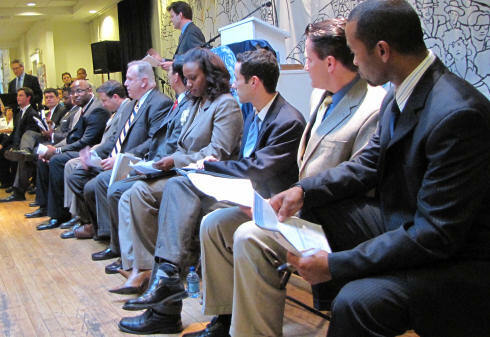 Image of Ward 21 Democratic Committee members in May 2009 from their website. For those of us who have been spending many waking hours trying to prepare for a series of city councilor candidates forums -- er, fora -- and debate, lots of those hours are spent figuring out the logistics: what days venues are available; religious holidays to avoid; candidate appearance schedules; food and drink for attendees and setup/cleanup crew; arranging for, and setting up, the sound system; publicity; setting the format; arranging the hall, including tables and/or podiums; convincing someone to take audio and/or video, then getting it online; talking with people and researching questions; etc. And then actually running the event that night. A lot of work, only a small amount of which is substantive about city and neighborhood issues. John Carroll watched the debate last night between incumbent Mayor Thomas Menino and challenger Councilor-At-Large Michael Flaherty and has some sharp criticism of the event. Carroll, a professor of mass communications at Boston University, can always be counted on to see through the clutter and posturing to judge how effective the various tools of the media work -- or don't -- to further the political process. Two thumbs up for Carroll, who invented a new term by saying that he was "dead blogging" the event, i.e., to wait until the event is over to write about it. He brings in analogies to trailer parks ("doublewide podiums"), Halloween ("Spooky World" lighting), arcade games (so many moderators "had sort of a pinball effect on the proceedings"), and Homer's Odyssey (Menino was more incoherent than usual, such that he was "totally channeling James Joyce"). Was the most uncomfortable moment of the night when Menino was pressed about the lack of diversity in his administration by an all-white panel of journalists? Ouch. Clever, biting, sarcastic... but totally fair criticism. I only hope Carroll doesn't watch our district 9 city councilor debate tonight, sponsored by the Brighton Allston Improvement Association. Image of Menino [left] and Flaherty [right] taken from a screen capture of NECN's video feed of the debate. Boston University's independent student newspaper, The Daily Free Press, sent a reporter to cover the candidates forum Thursday night for the Councilor-At-Large race. His story is worth a read. Adam Gaffin at Universal Hub blogged extensively the candidates forum for the Boston City Councilor-At-Large race. It's worth a long read. Felix G. Arroyo provides insight as to why so many elderly Russian Jewish voters backed him last month: because of his work for immigrant rights. Andrew Kenneally wants the city to strong-arm universities' institutional expansion by holding back re-zoning and building permits in order to demand more money through PILOT. Connolly: Two legislative accomplishments you're most proud of. Connolly. 1. Securing committment from mayor to triple number of hybrids in city fleet. 2. Working with Murphy on financial-disclosure law. Murphy. 1. Financial accountability ordinance with Connolly. 2. Reformed retirement-board system (people out injured five-six years). 3. Grease-duct ordinance after Tai Ho fire. Tomas Gonzalez made reference to the BRA's task forces when calling for some reform at the agency, questioning whether the mayor should be appointing their members. Connolly noted that Mayor Thomas Menino's proposal (a bill in the state legislature) for state-chartered public schools that would be controlled by the Boston School Committee is too vague to evaluate. Should the charter school cap be lifted for Boston even if it leads to public school closures? Kenneally. I'm against charter schools for a number of reasons. One: I believe i nunions. Steal money away from Boston public schools. They pick and choose - they don't take special needs students. Success based on false data. Tito Jackson repeatedly exhibited a good sense of humor, including some self-deprecating remarks. Ayanna Pressley identified increased transparency and increased community input as reforms that are needed at the BRA sooner rather than later. Should anyone in city government be held accountable for giant holes in the ground? Bennett. Yeah, Mayor Menino should be held accountable. I think the BRA should be elected. Filene's looks like a bomb went off in the center of Boston. Gaffin also gives a good summary of where the candidates stand on the issue of casino gambling. I agree with his assessment that the candidates sounded generally supportive of the idea of having a casino somewhere in the City of Boston. That is a change from two years ago. While the issue is one in front of the state legislature, it matters at the municipal level because a community will have the opportunity to welcome or block any proposed casino within the city limits. Middleborough's town meeting met and voted on a particular proposal put forward by the Wampanoag. More action from other communities around Massachusetts is likely if the bill begins to gain traction in the legislature -- which is likely, now that the House Speaker is supportive of the idea. Most surprising to me was the support for the idea expressed by Andrew Kenneally, who lives in East Boston and would be most directly impacted by such a casino. My instinct is that East Boston residents will be the loudest opponents of the proposal; Kenneally's response leads me to rethink that assumption. Image by Abigail Furey; all rights reserved. 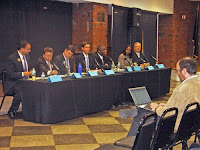 Candidates [left-to-right]: Felix G. Arroyo, Andrew Kenneally, John Connolly (incumbent), Doug Bennett, Tito Jackson, Ayanna Pressley, and Stephen Murphy. Not picture: Tomas Gonzalez, who arrived a few minutes later. The first negative mailing of the Allston-Brighton District 9 City Councilor campaign arrived in the mail today. Two years ago, we sent him to City Hall. He promised he'd work for Allston-Brighton. Two years later, what did we get from Mark Ciommo: NOTHING DONE. Accompanied by an unflattering image of Ciommo, natch. Since there are plenty of days until the election, there's plenty of time for Ciommo to respond with his own negative mailing. If he decides to go that route. Stay tuned. Selvig appears to have tipped his hand in advance of Tuesday's candidates debate; Ciommo now has a few days to prepare his defense. I have a feeling that we will see some, er, lively back-and-forth on Tuesday. Light refreshments will be served for a meet-and-greet with the candidates beginning at 7:00 pm. Attendees may submit questions for the candidates prior to the 7:30 pm start. Due to time constraints not all questions submitted will be selected. No campaign signs inside the venue, please. We hope to film the event and stream the video online. The preliminary election to narrow the field from four to two candidates will take place on Tuesday, November 3rd. This election will shape the future of our neighborhood and this is your opportunity to meet the two finalists running for Allston-Brighton's City Council seat. Please come and hear where the candidates stand on current neighborhood issues as well as their vision for our community. A lot of words have been written about the diversity of the candidates for Boston City Councilor-At-Large this year. It has sounded like a mini revolution in the making. We now hear that the revolution will be televised. The Boston Neighborhood Network has decided to send a camera team to the BAIA Candidates Forum Thursday night. They will broadcast the footage at a later date and stream the video online. BNN this year did a series of interview shows with the candidates for various city council races -- including the District 9 City Councilor candidates. They are claiming quite a niche in the televised coverage of the city councilor candidates. Image of an old TV camera on display at the Newseum by mechanikat provided through a Creative Commons license. Boston Police recently appear to have been conducting license checks on a number of Allston-Brighton businesses. The 7-Eleven convenience store at 584 Washington St. in Brighton was found to be a holder of an active 2009 retail malt and wine license, but the premise was found to have discontinued the sale of alcohol, so it received a violation for non-use of a license. The 7-Eleven in Oak Square just got cited for not selling booze? Come on. If they aren't using their license, then the city should just take it back. The neighborhood obviously won't miss the loss of that one license. 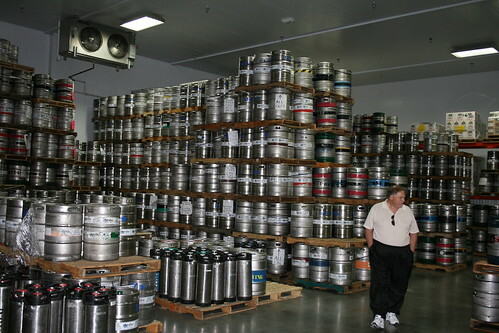 Image of Beer kegs by slworking2 provided through a Creative Commons license. How should a city archive its employees' emails in a 21st century information technology environment? As an astrophysicist, I deal with large datasets which can be updated daily with 10s or 100s of GB every day; the next generation of projects will create TBs of data daily. We need archives in astronomy, and are constantly searching ("querying") them in order to select out data of interest. Some datasets go public immediately; others are always private; while others have a proprietary period (such as the standard NASA 1-year) after which the data become public to anyone. And we store lots of additional parameters in the archives, not just the data themselves, which allow for robust searches for unusual astrophysical objects, date ranges, keywords, etc. Archiving at city hall shouldn't be much different -- it's just a lower bandwidth problem. Michael Kineavy, the chief of policy and planning in the administration of Mayor Thomas Menino, daily deleted all of the emails in his inbox and then deleted them again from his trash folder before the automated computer backups would run at midnight every day. The problem with his deletions is that the emails are public records which are illegal to destroy under the state's Public Records Law; Kineavy has taken an indefinite, unpaid leave of absence until the matter is resolved by Secretary of the Commonwealth William Galvin and Attorney General Martha Coakley. The city implemented a comprehensive program that immediately creates a record of all user messages sent and received no matter what each individual does with them. All journaled messages are kept in the archive for three years. While I don't know the details of the city's newly deployed archival system, it sounds relatively similar to the Blast article's suggestion. Lost in this technological solution, however, is how the storage and retrieval system can be designed in a manner that serves the public interest while reducing governmental waste. 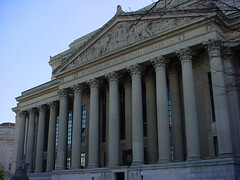 The design of the archive is dictated by the "requirements document," i.e., the text of the state's Public Records Law. The whole current system is arcane, to put it mildly. In this 21st century, we could easily require through state law that electronic public records are archived and served to the public in a seamless, cost-effective, and transparent manner. Some public records can be withheld from release according to 16 exemptions listed in the PRL. These exemptions range from personnel matters to personal information (home address of a public employee) to pending litigation. Any archival system should include a classification tag as to whether the document is fully public, or if it is exempt (along with the particular classification). Documents (letters, emails, etc.) become public records the moment they are created or received. The logical time to classify those documents as either public records is when they are first read by a person. The email application (MS Outlook, Thunderbird, Evolution, etc.) could be configured so that a user must always classify the email as public or exempt before allowing him to move to the next email in the inbox; that classification then gets stored in the archive. Once a document has been made public it is always public. If someone accidentally released a document, then the person must continue to release it. (No Uruguay Round of copyright law where works in the public domain can be reverted back into copyright.) Once a document is released, it can be tagged in the archive as such, freeing it from ever needing another review. State law does not require electronic documents to be provided in electronic form. The city has delivered Kineavy's 5,018 emails in paper form, then scanned the paper versions, and finally put the PDF scans on the internet. This is time-consuming, wasteful of paper, and annoying since the PDF documents are no longer electronically searchable -- a 20th century way that government offers the public its middle finger. The cost of searching and reviewing documents in response to a public records request can be charged to the requester. This is the most frustrating part of the PRL, since some records requests generate estimated costs of thousands -- or hundreds of thousands -- of dollars mostly in the charge to review all those documents one-by-one. If the search could be done using automated tools available to anyone -- inside or outside government -- then many man-hours could be saved; the member of the public now wastes his or her own time using the search tool, while the government employees are left to go get a cup of coffee instead. Or do their other job duties. The search tools are easily designed so that they only release documents that are public, and can generate summary lists of emails that are being withheld because they are exempt. A government employee: receives an email; clicks on it to read it; when he clicks on the next email a dialog window asks him to classify the previous one first as either public or exempt; and so on. (The same goes for outgoing email: the employee has to classify it before the mail system will send it out to its recipients.) When the email was received by the city hall server it is immediately archived; when the employee classifies it, the classification is immediately entered into the city hall archive. If the email is a public document, then it is served up on the internet immediately. A member of the public: wants to obtain some public documents; goes to the city's website; runs a search using a set of criteria (date range; email to/from/cc name[s]; keyword search; etc. ); inspects the two sets of documents returned by the search engine (the public records resulting from the query and a summary table of the exempt documents); and downloads the documents he wants or starts a new query. No government employee has to waste a single moment of time responding to the public records request. Now that is efficiency in government! What are the obvious holes in such a 21st century system? It has to be designed with the idiot government employee in mind. I don't mean to imply that all or most government employees are idiots, but that any system has to be designed in a way that the least clever employee can't release everyone's health records onto the internet. I can also imagine that some employees might think twice about sending so many three word emails when they have to classify each one before it is sent. And employees who like to make rude comments about members of the public will think twice before doing so in an email. Actually, that's a good thing. I am under no illusion that any politician would be so crazy as to vote yes for a law that would require government electronic records to be served up in real time on government web servers. Remember: the state legislature has already exempted themselves from the state's Public Records Law. But it is a neat thing to think about. In this Year of Astronomy celebrating the 400th anniversary of Galileo pointing his telescope at the heavens -- and President Barack Obama gazing at Jupiter from the White House lawn -- city hall might strive to reach the heavens by creating a transparent government whose electronic public records are served seamlessly to the citizenry. 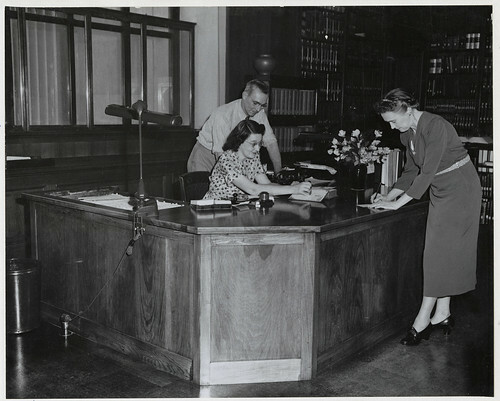 Image of a desk inside the National Archives in the 1950s by C. Getts provided by The U.S. National Archives, and image of the National Archives by marttj, both provided through a Creative Commons license. Light refreshments will be served for a meet-and-greet with the candidates beginning at 6:30 pm. Attendees may submit questions for the candidates prior to the 7:00 pm start. Due to time constraints not all questions submitted will be selected. No campaign signs inside the venue, please. If you wish to submit a question in advance of the forum, please email pahre@comcast.net by Monday, October 12th. September's preliminary municipal election narrowed the field to eight candidates for four elected positions of Boston City Councilor-At-Large. The final municipal election will be held on Tuesday, November 3rd. This election will help shape the future of our neighborhood and this is your opportunity to meet the candidates running for the four seats. Please come and hear where the candidates stand on current neighborhood and city-wide issues, as well as their vision for our community and city. Note: The BAIA's District 9 City Councilor Debate is tentatively scheduled for Tuesday, October 20th at 6:30 pm at the same venue. Coverage of the 9/17 District 9 City Councilor Forum can be found here and here. Update (10/14/09): BNN has decided to video-record the candidates forum. They will broadcast it at a later date, and will also stream it from their website. Image from a prior candidates forum cribbed from Adam Gaffin without getting any permission from him whatsoever. The store employee described one of the suspects as a Hispanic male, about 5’8”, weighing 170lbs, wearing a gray hooded sweatshirt, a black t-shirt and a dew rag; the other as a black male, about 5’10”, weighing 250lbs, wearing a black hat and a black jacket. Surveillance photos of the two suspects can be found here. In the last couple of years, nearly nightly blues and jazz at Smoken' Joe's BBQ restaurant has been a welcome addition to Brighton Center's otherwise mostly quiet music scene -- which was pretty much just the bands and Irish play-alongs (Seissun) at the Green Briar Pub. But fans of more traditional classical music, or world music, were mostly out of luck. Last year the Brighton Allston Congregational Church began an eclectic monthly series of music concerts, selected in order to highlight the diversity of its congregants and the community. Their concerts serve as a Brighton mirror to the irregular series of events held in North Allston at the Honan Allston Public Library's auditorium. The BACC is known around Brighton Center for their Wednesday and Saturday thrift shop, Wednesday night community supper, Saturday food pantry, and church bell that tolls hourly -- but often gets out-of-whack, such as how it presently is tolling at eight minutes past every hour. I've intended for quite some time to drop by the new BACC concert series, but my schedule just never seemed to match theirs -- until last Sunday afternoon, when I was treated to some four-hand French piano music played by Bert Yocom and Linda Papatopoli, faculty members at the Boston Conservatory and Boston College, respectively. The first half of the program with Maurice Ravel's magical transcription of Claude Debussy's Prelude to the Afternoon of a Faun (originally for orchestra) and Francois Poulenc's Sonata. That the duo have been playing together for nearly a decade showed in their well-choreographed hand-crossing in the the Prelude and first movement of the Sonata. The second half of the program brought an obscure suite by Erik Satie having far more than three pieces -- but peculiarly named "Three Pieces in the Form of a Pear" -- and the far-better known Dolly Suite of Gabriel Faure. The playful Satie evoked a number of giggles from the audience, while the more lush romantic feel of the Faure flowed naturally and freely throughout. While the program skipped over Darius Milhaud (he only wrote one work for four-hands), his student Pierre Max Dubois was represented in the encore with three pieces (Pleasantry, Mazurka, and Waltz) that evoked Jacques Ibert's light music. Next month's event won't be music per se, but will feature poetry read by Boston Poet Laureate Sam Cornish, a resident of Brighton. I haven't yet figured out the date of the event, since the organizers seem to be experimenting with the optimal day and time of the week in order to draw the best crowds. The BACC is not charging admission to their concert series, but has a suggested donation based on what concert-goers can attend. The money raised is going towards renovations of their basement which holds a community supper every Wednesday night at 6 pm. More happenings are listed at their blog. 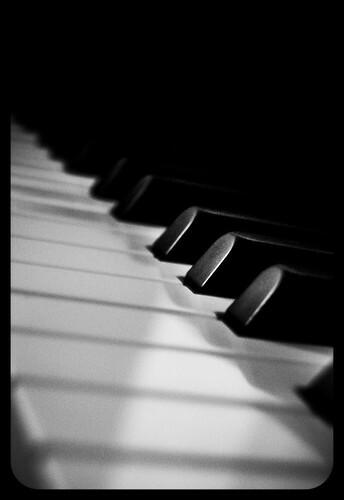 Image of Piano by Isa provided through a Creative Commons license.